The nation will observe Veterans Day this weekend without a single American survivor of the First World War alive to mark the occasion. Yet as we approach the 100th anniversary in 2014 of the “war to end all wars,” you will doubtless hear much about Frank Buckles, America’s last doughboy. 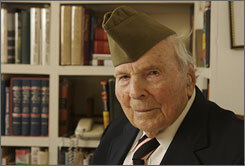 I interviewed Buckles on his West Virginia farm in 2007 when is was 106 years old. At the time I featured him in a USA TODAY cover story, he was one of four known surviving veterans of World War I. Soon after, I was offered a book contract to write about his Zelig-like life, which the publisher wanted in a hurry given Buckles’ advanced age. While the deal fell through, the book proposal eventually fell through, an outline I prepared of his Zelig-like life came in handy when I wrote his obituary for AOL News four years later when he was 110. One of the first stories I covered for The Huffington Post was Buckles’ military funeral at Arlington National Cemetery. In a nod to the new multimedia world we all now live in, I used my iPhone to shoot a clip of the honor guard removing the coffin from the caisson. Before the funeral, though, I led the reporting on Buckles’ daughter’s insistence that he lay in honor in the U.S. Capitol rotunda. Having covered President Ronald Reagan’s state funeral, I knew that would be highly unusual given that only 32 national figures had been similarly honored. One of my articles, an exclusive interview with the family of one of the most highly decorated soldiers of WWI, contributed to the decision by congressional leaders to deny the request. Buckles lives on in the fight over dedicating a national memorial to World War I veterans in Washington. Before he died, his daughter and a Michigan filmmaker wheeled him into a U.S. Senate hearing room to speak in favor of nationalizing a modest monument to District of Columbia residents who fought in the war. But as I reported, local officials — whose constituents died and still die for their country without a vote in Congress — revolted and the monuments backers are now looking to establish their memorial elsewhere on the National Mall.